Chez Dyna is a charming old maison de Maitre in the centre of Alaigne, which has been lovingly restored by present owners Lin & Geoff Faulkner. It is an ideal relaxing location to base your exploration of the Cathar country. Chez Dyna is less than half an hour to both the magical city of Carcassonne, the only fortified town in Europe still inhabited and the spiritual hilltop village of Rennes-le-Chateau, site of many Holy Grail excavations, and just 15mins. from Limoux. Chez Dyna which also offers B&B accommodation now offers two newly refurbished very pretty gites (cottages) for holiday rental. We aim to offer guests a friendly, stress free stay with the possiblilty if desired, to blend self contained gite accommodation with b&b at our bed and breakfast next door. We can be flexible about the duration of stay as well as the day of arrival and departure. Our aim is for you to have a happy, peaceful & stress free holiday. Situated in a lovely village with small art gallery and boutique gift shop,bakery & grocery shop. There is a small outdoor swimming pool (summer only) and a cafe- bar just 3km. away and a superb restaurant 5km. away. This property is just half an hours drive from Carcassonne and offers a welcome quiet oasis after a day of busy sightseeing and exploring. We also offer the possibility to dine with us or take breakfast with us from time to time (extra charge) and you can enjoy the conviviality of mixing with the locals in the freindly local bars. Premium quality cycles of all levels of sophistication - including electrically assisted are available for rental in our village. The catalyst for our life in France and the name of our Chambres d'Hotes was our first classic French car, a 1951 Dyna Panhard. In fact, the actual car which was shown at the London Motor show in October 1951 Chez Dyna was love at first sight despite the extensive work that was immediatly necessary !. We have lovingly restored the house over a 5 year period and our enthusiasm both for the house and our village has not waned. Since opening as a Chambres d'Hotes three years ago we have met many interesting people from different countries. It is a pleasure to share our home and to share stories over a glass or two of wine. Recently we have added a little cottage, a small art gallery and transformed an old forge into a gorgeous apartment for those who prefer self catering holidays. This area is perfect for exploring the mythical Cathar country and tasting the local wines and food. We are in a lovely village just Half an hour from Carcassonne and Rennes-Le-Chateau. Our village has its own shop, Bakery, post office, tiny school and art gallery / boutique gift shop - so we can be in a peaceful setting among the vineyards yet just a short drive to the local attractions. Carcassonne Airport is less than half an hour away whilst Toulouse, Beziers and Perpignan can be reached in just over an hour yet this perfect location allows you to experience life in a genuine French village. Notes on accommodation: We have two cottages available - One with one bedroom and another with two bedrooms - please ask for prices. Both properties have their own quiet outside space for sitting & dining and we welcome guests to use our quiet garden just next door. Please ask for latest availability because we do not keep this calendar updated. Outside: Private area for sitting / dining outside and guests are encouraged to also use the garden of our main house. Private off road parking is possible. Cleaning / Towels / Linen / Maid service: All towels, bedding, linen etc are included and there is NO ADDITIONAL CHARGE for cleaning at the end of your stay. We do however expect you to leave the property as you found it and to pay for any breakages. Well equipped property, ideal location for Carcassonne. thanks Lorraine for your review. 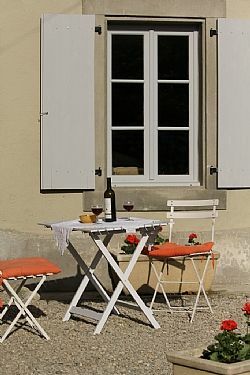 We are pleased that you found Chez Dyna to be a relaxing base from which to explore the Carcassonne area. Myself and a work colleague stayed in L'ancienne Forge gite while we were in the area for business. It was a really great space to relax and work in and Lin and Geoff were great knowledgable, helpful hosts! Un soggiorno rilassante e romantico quello che io e il mio ragazzo abbiamo trascorso dal 21 al 28 marzo da Chez Dyna, nella fantastica regione dell'Aude. Abbiamo optato per il self catering e prenotato il delizioso "Cottage" Gite a Chez Dyna. Il cottage e' ben curato ed e' stato rinnovato recentemente con stile e buon gusto dai proprietari Lin e Geoff. Il Cottage e' pulito e fornito di tutti i confort necessari e immaginabili: utensili, pentole e piatti; c'e' un caminetto a legna che abbiamo acceso una sera per guardare un fim. Anche il giardino, sul retro del B&B, e' accessibile da tutti gli ospiti. L'accoglienza di Lin e Geoff ci ha fatto sentire fin da subito come a casa. Ci hanno suggerito ristoranti, mercatini delle pulci, bric a' brac, paesini e luoghi da visitare tra Tolosa, Carcassonne e in generale nella regione Catara. Chez Dyna e' immerso nel verde, nelle campagne dell'Aude, tra sentieri e vigneti ed e' un ottimo punto di partenza per chi come noi volesse esplorare la regione Catara. E' stato un soggiorno meraviglioso, un'esperienza da ripetere ogni volta che si vuole davvero staccare la spina e, anche se un po' distante dal paese di Limoux (circa 10/15km in macchina) ne vale davvero la pena. Un'ultima "chicca" che non posso non nominare e' la galleria d'arte " La Forgerie" inaspettatamente fornita di eccellenti pezzi d'arte: foto, dipinti, abbigliamento e oggettistica fatti a mano da artisti locali e non e a prezzi ragionevoli: ottima per chi, come noi, lascia l'acquisto dei regali all'ultimo momento. Altamente raccomandato!!! Anche il B&B sembra ottimo. Grazie Lin e Geoff!!! Torneremo senz'altro a stare da voi! I stayed in The Old Forge Gite next to the Art Gallery. It was like a home from home - modern styled very comfortable and ideal as a base for my expeditions. Beautiful part of the world, friendly locals and the owners are lovely. Thoroughly recommended. During the months of May and June 2014, I made my home at Chez Dyna for relaxation and for work. I couldn’t have discovered a more perfect setting in France for what I needed. I found my beautifully furnished gite, the truly quaint village of Alaigne, my slow evening walks, and the surrounding vineyards and weather just what I was looking for. The owners of Chez Dyna, Geoff and Lin, assisted me giving me information for touring. They informed me of events and sites near Alaigne and the surrounding area that I wouldn’t have known otherwise. I will be returning to the same gite during the months of May and June 2015. Un accueil chaleureux et respectueux.les proprio sont dispo et a l écoute.très agréable gite, propre,très bien fourni.le village est superbe ainsi que la région alentour..vivement conseillé. Information / tutoring etc on wine and wine tasting tours can be arranged. Cathar history tuition can be arranged. Snowboarding tuition can be offered. Limoux (home of the Blanquette de Limoux) 15mins. Chez Dyna benefits from being able to offer a location only half an hour from the bustling city of Carcassonne, but in a tranquil village set in the Malepere vinyards. The village boasts is own cafe - bar for dining or taking that early evening apero as well as having its own baker for those fresh croissants each morning. It is a perfect location to relax before the days' exploration commences.